I’ve no idea who decides these things – probably Someone in Brussels* – but it says on the back cover of this novelty picture book, ‘WARNING: Small parts. Not suitable for children under 36 months’. Which is a pity, since the storyline and popping-up images are just fine for really small children. They will have to find a tame grown-up; while free-range readers up to six or seven will enjoy this one on their own. Sprat is bumptious, ‘cheeky as cheeky could be’, and for six out of the eight openings, he plays tricks on all the other denizens of the deep by yelling out, ‘SHARK ATTACK!’ or ‘LOOK OUT, IT’S SHARK! HE WILL EAT YOU FOR TEA!’ Each time, strongly-crafted, witty models come springing up from the pages, as crabs and clams and octopuses and eels swim and slither and slide for cover into shells and old sea chests or beneath rocks and seaweed, thanks to the paper engineer’s art. All of this, of course, much to the amusement of the grinning Sprat, lurking somewhere in the picture. If only Sprat had listened on the seventh opening (compare Boy crying Wolf) to someone calling out, ‘SWIM AWAY, EVERYONE’, he wouldn’t have had such a fright on the eighth, when there really is a huge shark soaring up, toothy mouth gaping, snout way out beyond the head of the page, tail way out beyond the foot. ‘Yikes,’ splutters Sprat, and it’s a good job that shark (I think) has got a hint of a kindly smile on its face. A sadder and a wiser Sprat lives to swim another day. There’s plenty to seek out on second, third and many more readings, and the tale bounces along in rhyming verse crying out to be enjoyed aloud. 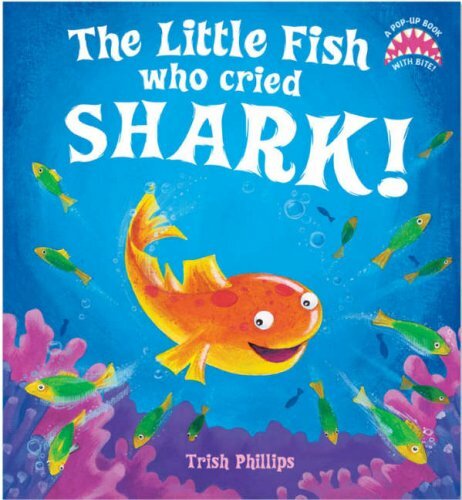 *On children’s novelty titles (bath books, pop ups etc) you should, as in the case of The Little Fish Who Cried Shark! , find the CE symbol which means the book has been tested in order to comply with the safety provisions of the relevant legislation implementing European Directives. A warning about small parts may also be required. Ed.